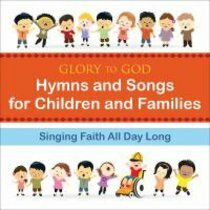 "Glory to God--Hymns and Songs for Children and Families" was created to help people share songs of the Christian faith with children. The variety of music, lyrics, prayers and poems form a soundtrack for children to know themselves as God's children. These 19 songs and 4 prayers were taken from the "Glory to God" hymnal and adapted for children by professional musicians, creating a high-quality complement to the hymnal. This recording was created for families to share songs of the Christian faith in a natural, every-day kind of way. The variety of music, lyrics, prayers, and poems weave a soundtrack to live by - "All Day Long" Parents and grandparents, enjoy these songs with your child as you honor your role as faith mentor. Children appreciate the beautiful, simple, common, and sacred.Songs of faith and hymns children learn in childhood lead them to lives of service and discipleship.Children remember particularly what they learn through music and poetry.The songs can be enjoyed by all generations together.Young children love to listen to and sing with their special adults. Sing along or listen to them at home, in the car, with family and friends.Play the recordings at the four parts of the day: morning, mid-day, evening/suppertime, and night/bedtime.As you and your child get to know the pieces, sing or say them as they occur to you during the day.Create your own prayers and songs with your child.Include the calming-down pieces in your child's (or your) bedtime routine.Encourage the use of these recordings at events in your congregation: church school classes, children's choirs, all-church events. Look online at www.pcusastore.com/SingingFaith for additional suggestions for activities to accompany these songs. About "Glory to God: Hymns and Songs For Children and Families"